This high-quality metallic boundary post is fitted with a spring at its base, allowing it to flex. Use this to delineate car parking space edges, providing clear visual and tactile feedback to drivers if they deviate from the parking space. 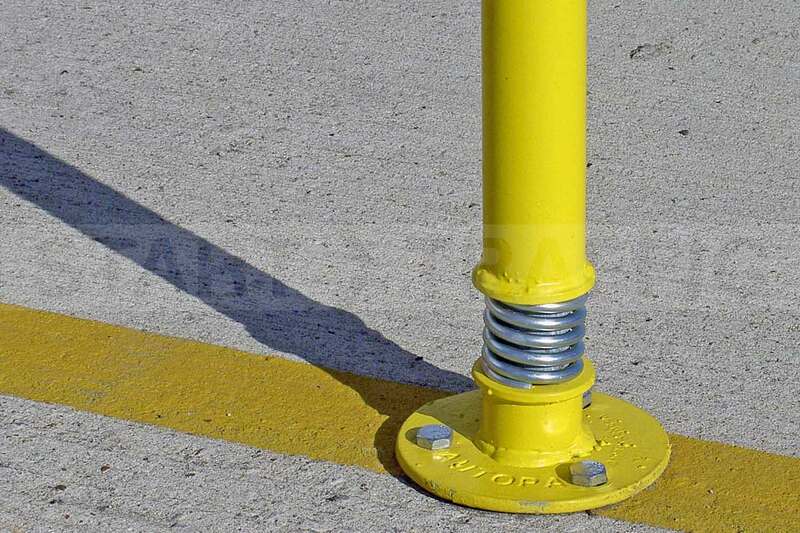 Unlike rigid parking posts, this post has a spring in its base that allows the post to flex if a vehicle makes contact with it. 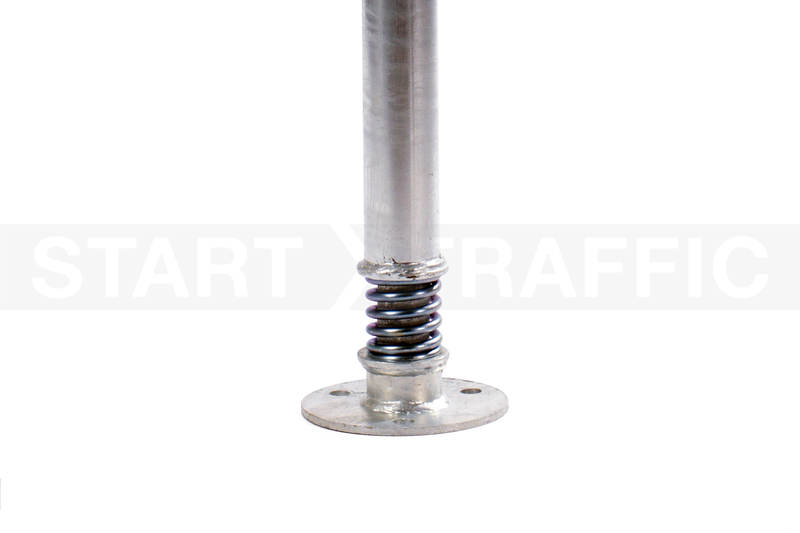 This spring loaded post can deflect up to 30 from the vertical and then return to being upright after. The post stands at 750mm from the ground when installed, and features a large spring at the base of the post. Two fixing options can be used to secure the post in position. A plastic cap prevents water ingress at the top of the post. A reflective band fitted around the post maintains exceptional visibility in all lighting conditions. Simple Installation Process – Either Cast in or bolt to the surface with 3 x M12 fixings. High Visibility – Reflective band ensures that drivers can easily spot the bollard whilst manoeuvring. Minimal Impact – Designed to inflict the least damage possible to vehicles that make contact with the post. Far more forgiving than a fixed boundary post or bollard. Galvanised Finish – A protective coating that chemically prevents rust. Even coloured posts are galvanised beneath the paint. Cost Effective – Cheap to purchase with minimal outlay. Highly Durable – Unlike fixed bollards, these are not damaged beyond repair after their first impact. 1 Year Warranty – Guaranteed against any manufacturer defects for the first 12 months if correctly used and installed. Find sprung boundary and parking posts in car parks in front of parking bays. These parking posts are also frequently installed at commercial units on the boundary between two properties. Providing an indication of where the parking boundaries are. 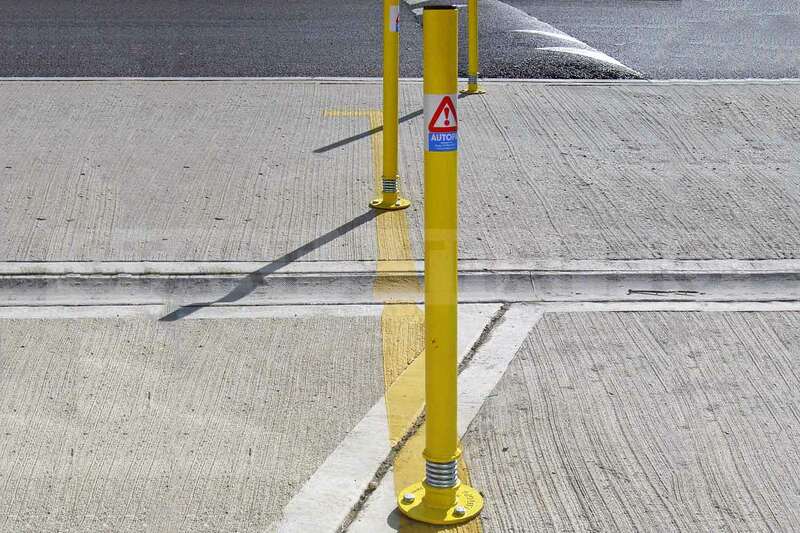 These are ideal for tight multi-storey car parks to outline corners and raised pavement sections without using a traditionally fixed post that can inflict significant damage to a driver who misjudges a corner. There are two options to select from when buying these spring-loaded parking posts. The second option is a cast-in post (ragged). To install this a small excavation will need to be created (300mm cubed) and filled with concrete. The method of installation you select will depend on the road surface that you have available. If you require these posts to have chains attached to them we are able to have them custom made with eyelets fitted. If this is the case then please contact us for a quotation. Give our sales team a call today on 01905 794 875 to discuss your sprung parking post needs. They will happily discuss the budget, pricing, and installation options with you.